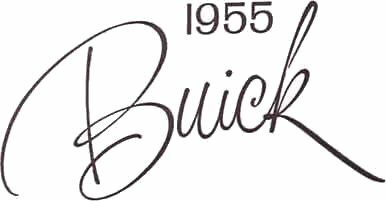 Your choice of any two 1955 Buick colors -- over 200 combinations in all -- at exceptionally modest cost. Drag your cursor across the colors at the left. All Paint schemes shown with Carlsbad Black tops. 3-Tone color choices are limited to the following combinations. Alphabet Code Letters designate colors which are available for solid, two-tone, or three-tone color combinations. The firsst alphabet letter designates the upper color, the 2nd alphabet letter denotes the center color, and the 3rd alphabet letter denotes the color below molding, i.e., Combination AAA would be all Black, and ADB would be Upper-Black, Center-Windsor Gray Metallic, and below moulding- Dover White. Color code numbers appear on a plate on the right side portion of the firewall under the hood. I scanned the below colors from a DuPont December, 1954 Color Bulletin and matched them as close as I could with "web colors". '56 colors available on '55 models. It appears that my car was originally 100% Dover White. Ambulance?